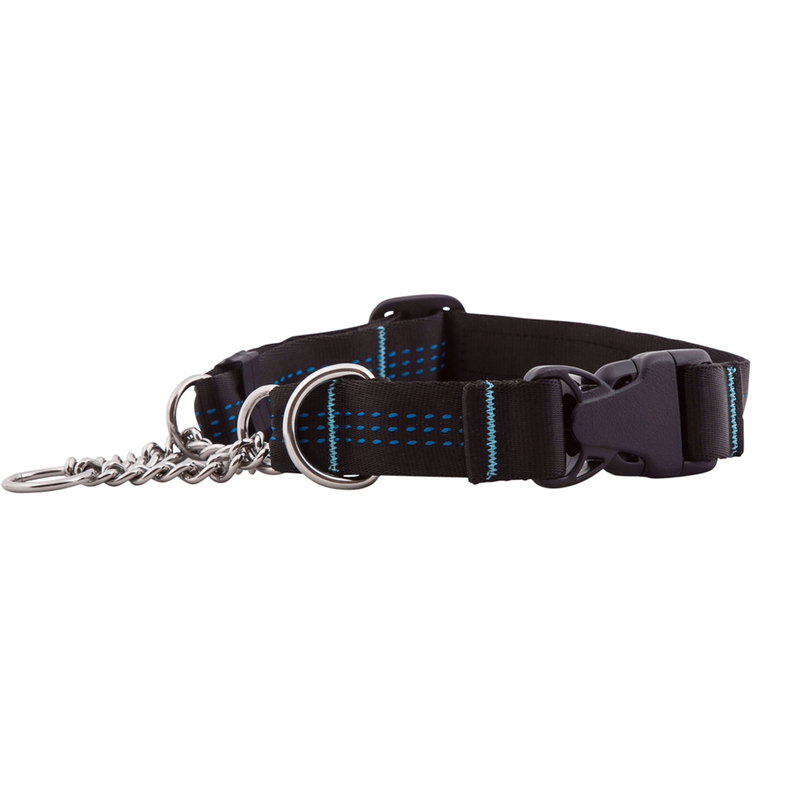 The Quick Release Martingale Dog Collar in Black is a great collar to correct your dogs behaviors when out on a walk with the audible sound. Limited slip action prevents over correction. Side release buckle for easy wear and release. Machine wash cold on delicate cycle. Dry flat. Place in a wash bag to prevent hardware from damaging machine. Do not bleach, do not iron, do not dry clean. If needed, pre-soak in an enzymatic cleaner like Nature's Miracle. X-Small: Neck 8-12" Width 3/4"
Small: Neck 10-16" Width 3/4"
Medium: Neck 14-18" Width 1"
Large: Neck 16-22" Width 1"
X-Large: Neck 18-26" Width 1"
Posted On 05/17/18 by Elizabeth P from Buchanan , MI Yes, Elizabeth P recommends this product! Bought this in XS for a 12 week old Sheltie. Fits perfectly and he’s happy wearing it. Excellent quality and feel. Posted On 10/04/16 by Christina E from GLENDALE, CA Yes, Christina E recommends this product! Measured my dog's neck and he was between 16" and 17" got the large but it was too big. Reordered the medium and used the large in the meantime, still made a big difference to our walks. My dog doesn't really pull but tends to sniff and eat stuff he shouldn't so I use it to restrain him and get him to pay more attention to me on the walks. The leash feels satiny and the collar is wide which works for my dog's big head, he's a Glen of Imaal terrier. I would recommend this! We have a harness for our dog from Gooby for years, but could not find another. So glad to find one on this site. They are the best!